Hey everyone! I’m delighted to have Whitley Gray here today with her new release, Rabbit Wars published by Loose Id. Currently on the bestseller list at ARe, this one is definitely worth checking out! After two months in Dubai supervising a construction project, architect Jefferson Fontaine returns home to find his boyfriend boffing the dog walker. Reeling, Jeff grabs his dignity and departs. The arrival of a mysterious wicker box and a letter requesting Jeff’s presence for the reading of a local entrepreneur’s will sends Jeff to his hometown of Crooked Creek, Colorado. The last thing he expects is to encounter an old flame who disappeared fifteen years ago. After high school, Ashton Eiker hoped to start a future with the boy he loved, but his world crashed when Jeff refused to bring Ash along with him to college. Ash ran from the rejection, but returned to Crooked Creek a year ago, bringing his confectionery talents and opening a chocolate shop. When the great uncle of a childhood friend names Ash in his will, he could hardly anticipate getting a helping of his past in the mix. Jeff and Ash jointly inherit the historic Jeremiah Rabbit House, and are forced to work together to meet the terms of the will or neither will have the mansion. It’s a battle of opinions, shared personal history, and present attraction, but the true prize isn’t the Rabbit legacy. It’s the chance at something better. Here’s what people are saying about Rabbit Wars…The Romance Reviews says “Rabbit Wars is a beautifully written story with lovely descriptions of Crooked Creek and the places that make it special, and you can almost picture it in your mind, smell the pine trees and definitely the fragrance of the chocolates.” Full review by Susan Mac Nicol here. Hello, Whitley! Thank you for joining us here today! Tell us a little about yourself and the kinds of stories you like to write. I have written in other genres, but M/M is my favorite. I’ve always gravitated to the male protagonist in books of all kinds. Having two male main characters is even better. The dynamics between guys is completely different from a man relating to a woman, and I prefer that male/male interaction. Weeell…it does figure in. My mind has so many scenarios stored up from years of work that it’s literally a resource for pulling plot lines and character traits. Medical scenes/events in the stories often have happened, but the details have been changed. For characters, I have used bits and pieces of real people (probably myself more than anyone) to build characters, but none has been based solely on a single person. I’d say not intimidated so much as discouraged by unfavorable reviews. It used to be a bad review could make me physically ill. Then a writer friend gave me some great advice: reviews are for readers, not writers. And don’t read your reviews; move on to the next project. This was the idea on which I built Rabbit Wars. The story is set in a fictional small mining town in the Colorado Rockies, a town built on gold and chocolate. Instead of the Easter bunny, I created a chocolate dynasty established by a family named Rabbit. Of course, such a family would have to be eccentric and known by few. What would happen to the estate if there were no heirs? What would the last survivor do in the name of love and chocolate? Ash, a man who knew the Rabbit family years ago returns to establish a chocolate store. Jeff, who was also part of the Rabbit inner circle is lured back by chocolate and circumstance. Toss these two men together with a serving of conflict, and voila! Rabbit Wars was born. The story is part of the Eostre’s Baskets collection from Loose Id. 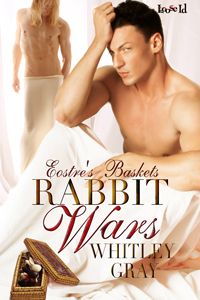 A mysterious basket plays a role in each story, and figures into the tale of love and war that is Rabbit Wars. Thank you so much for coming by, Whitley, and sharing with us a bit about your new release. Be sure and let us know when the next in the series is out! BIO: Once upon a misspent youth, Whitley read and wrote stories under the covers at night. At some point, real life intervened, bringing with it a career in the medical field. After years of technical writing, Whitley took on the challenge writing romance. Inventing characters and putting them in interesting situations turned out to be addictive, and having two heroes is twice as nice. A pot of coffee and a storyline featuring a couple of guys makes for a perfect day. Stop by www.whitleygray.com and feed your fix for heat between the sheets and M/M romance. Rabbit Wars is available through Loose Id and Amazon. This entry was posted in Uncategorized and tagged guest blog, interviews, promo, Sarah Madison, writing by Sarah Madison. Bookmark the permalink. Hey, my pleasure! You’ll have to come back again soon! I’d love to do something more in-depth–I’d love for you to talk about your blog, for example, and what an excellent resource that is for writers seeking answers to medical conundrums!